Creating Embroidered Products is a part of Banjara Craft which is practiced in Thandas and basically includes creating Jocket, Ghagras, etc. The craft is passing generation to generation and there can be seen an increase in the trend of making Embroidered Products. 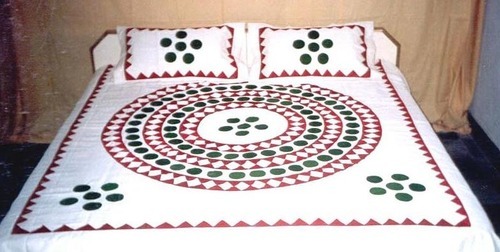 Right from Wall Hangings, Cushion Covers, Beds Sheets and to Sofa Sets, a large number of Embroidered Products can be seen being popularly sought-after in households. And to buy any of such Embroidered Products, buyers can contact us any time. We are a well-known name as Embroidered Products Exporter and Supplier in Andhra Pradesh, India. The cornerstone of Kala Srusti was laid way back in 1995. Since then, the company has been efficiently functioning under the management of Mr. G. Dasaradha Chari (Secretary). Following his guidance, the creative minds at Kala Srusti turn several themes and thoughts into stunning success. Today, based in Andhra Pradesh, the company caters to a large customer base across India and abroad. It is because of a number of prominent sources we have contact with that we can procure and deliver the best Home Decor Products and Gift Items. Likewise, it is owing to our well-developed facilities that we can provide the best services to our clients.